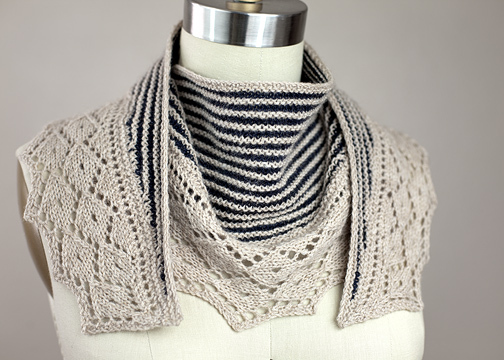 Enjoy all the wonderful comments about us & wool from v.2 of Bountiful Fridays – we love it! Sign up HERE to get all the current upcoming news, specials and events! Even thought it’s been slowly getting more spring-like all the time, a chilly wind still finds all the gaps. 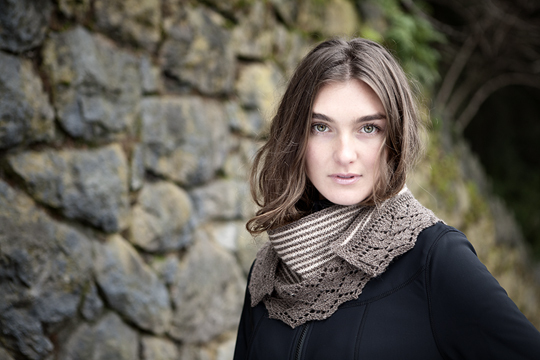 I’ve been chasing those little icy whispers by wearing a cowl, a scarf, or even a cap, indoors. So it’s with a little satisfied thrill that I’ve finally finished my 4th ALBY shawl and I’m going to put it to good use. First up: wearing it over the neckline of a jacket or coat, like this earlier version. This is the way I wear these crescent-shaped lovelies the most often – simply wrapped around the neck, with lace points resting on the outer sides of center. 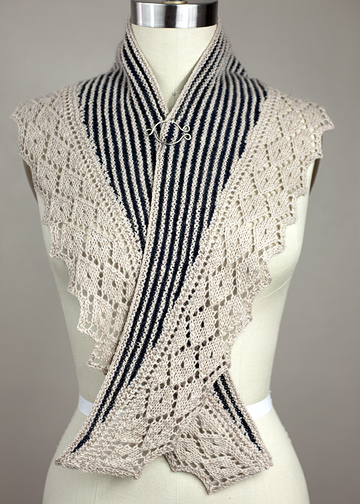 The middle part of the shawl acts as a cowl of sorts but the added layering of the ends adds just a little more warmth and cozy fit but showcases their lace detailng. Second: and this is getting to be a favorite. If you’re a fan of Regency period films or series, chances are you’ve seen something like this. Many of the dresses of that time period were more like jackets, worn over a linen chemise that puffed up over the low neckline of the outer layer. Often times there was another added finish: a scarf worn tucked into the bodice of the outer dress, or worn as a collar. 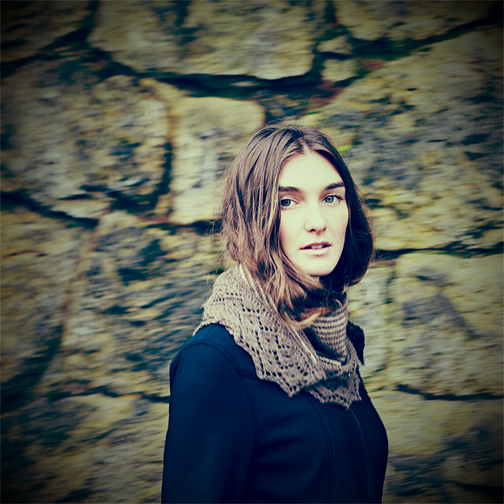 Even though I’ve been knitting for ages now (and designing from Studio Chic Knits for way over 10 years), almost every day, some nugget of info enters the scene, sometimes shaking it up, sometimes helping an idea cross the bridge from a thought to the needle. I’ve been trying to aid and abet the speed of the shaky times with as much information as I can find – so I have knit encyclopedias, how-to-books, stitch pattern books, etc. in lots of versions, types and publish dates. First of all: Clara Parkes. Known far and wide as the ultimate yarn whisperer, she really put the pedal to the metal on this tome and goes far and wide to give us a wonderful look into the way-back story of wool itself. From sheep breeds to the types of wool they produce to an abundance of project patterns to test your new knowledge (more than 20! ), it’s all there. 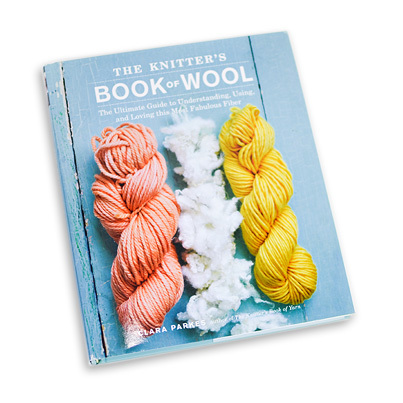 Secondly: this is a great basic go-to book to have in any knitter’s library. Even if you never set foot on a farm or go to a festival, it is an easy way to catch up on the organic nature and mystery of what’s been living on your needles all this time (and, yes, no mud…) There’s been a great renaissance of small producers here in the U.S. (and around the globe) and this book is perfect to help understand the evolution of some of the fabulous yarns appearing on the scene. 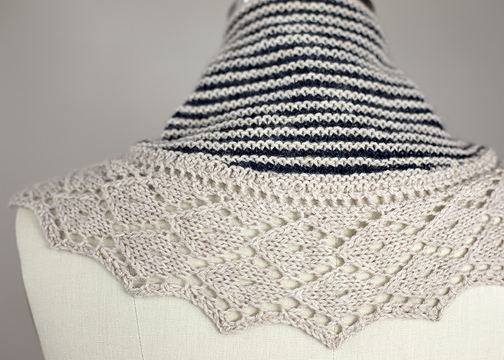 …from our last visit to Bountiful Fridays on Chic Knits: the winner of 2-skeins of ToshDK in the TART colorway is Sharon A. who writes, “I love knitting because it’s always in my heart.” yes.